10 perforated dolls: Explore the White House with Hillary, mow the lawn with Bill, and draft executive orders with staff and senior advisors. 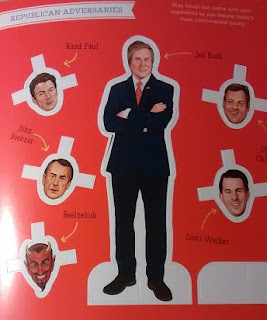 Republican adversaries: Stay tough but polite with Jeb Bush, Mitt Romney, Scott Walker, and other contrary characters. Outfits, accessories, and expressions: Pick the perfect pantsuit and expression of your choice (from Scholarly to Dignified Disapproval) to match every occasion. White House ghosts: Hang out with past residents of 1600 Pennsylvania Avenue, including George Washington. Nancy Reagan, and Jacqueline Kennedy Onassis. 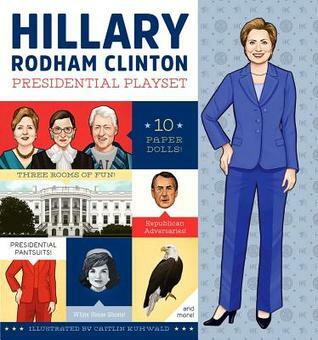 then this paperdoll playset would be a great Christmas gift. This post should not be considered a political endorsement of any campaign or political party. And in case I dated myself with the caption - Michael J. Fox played Alex P. Keaton, an ambitious republican teen in a staunchly democrat family, in the 1980s sitcom Family Ties.